Renea, a single mother living with her four children and ailing father finally won her home after living without water for six months. She is a first time homeowner who rented this house for seven years from a slumlord who didn’t pay the taxes. She wanted to stay in this home because it’s her only chance for ownership, and she isn’t afraid of the hard work – she’s grateful to have a path to make her investment pay off in the long term. Photo Credit: Emilie Evans. Sometimes, the hardest part of being a homeowner isn’t coming up with the funds to buy a place, but ensuring that once you own it, the roof actually works and the electrical wiring doesn’t barbecue your belongings. There are tens of thousands of vacant and neglected properties across the U.S., and at least as many people in need of stable housing — many simply need help navigating the challenges of acquiring and fixing up these places. Brick + Beam Detroit and the Tricycle Collective are two organizations helping folks in need of safe, stable living situations by helping them become first time homeowners with the skills and resources they’ll need. 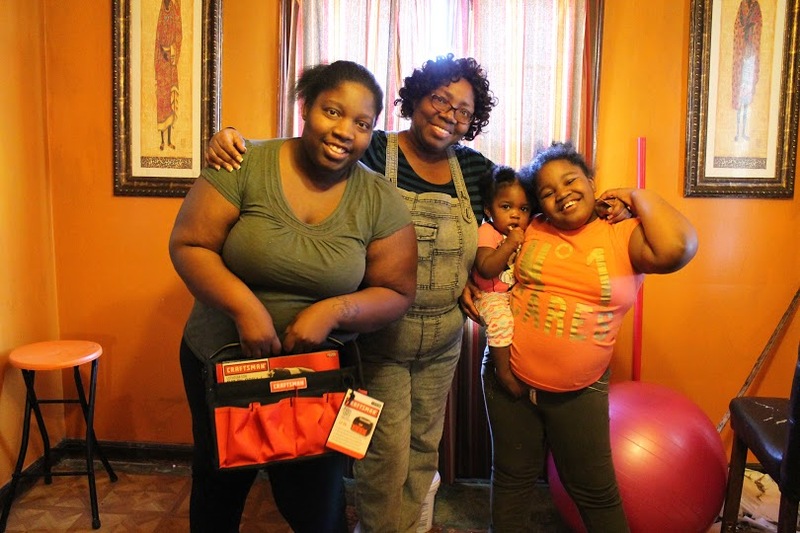 Last month, The ToolMade Project and Craftsman jumped in to help put some tools into these new homeowners’ hands. 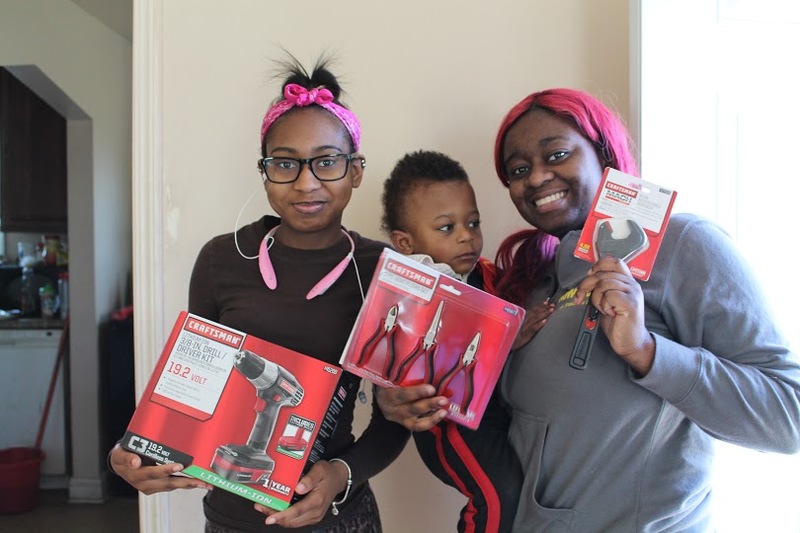 Kits full of homeowner tool essentials were given to six families in Detroit. Skip to the end of this article to see a list of the tools and a guide I put together with Emilie Evans of Brick + Beam Detroit to give some overall tips. These homeowners have a lot of work ahead of them, but are beyond excited to get to it. Photo Credit: Emilie Evans. Let’s be real — nobody is born knowing how to sand and seal floors, repair wooden windows, and ensure that their adorable toddler isn’t ingesting lead paint chips like they’re Corn Flakes. That said, with an extensive and creative support system (full of people who can laugh and vent about the occasional catastrophes that come with rehabbing a home), anybody can learn. The founders of Brick + Beam Detroit have created a community for building rehabbers of every skill and income level by hosting events, creating an extensive online platform, and sharing resources, stories, and whatever else is needed to help people to make their homes safe and comfortable. If homeowners are taught how to improve inexpensive, well-built, yet rundown properties, then the owners, the neighbors, the city…well, really, everybody wins. Charmelle lives with her mother and her 2-year-old boy. Her mom owned the house, but struggled to pay her property taxes and eventually lost it. The Tricycle Collective is now working to help Charmelle get her family house back so they can all stay together in the community they call home. 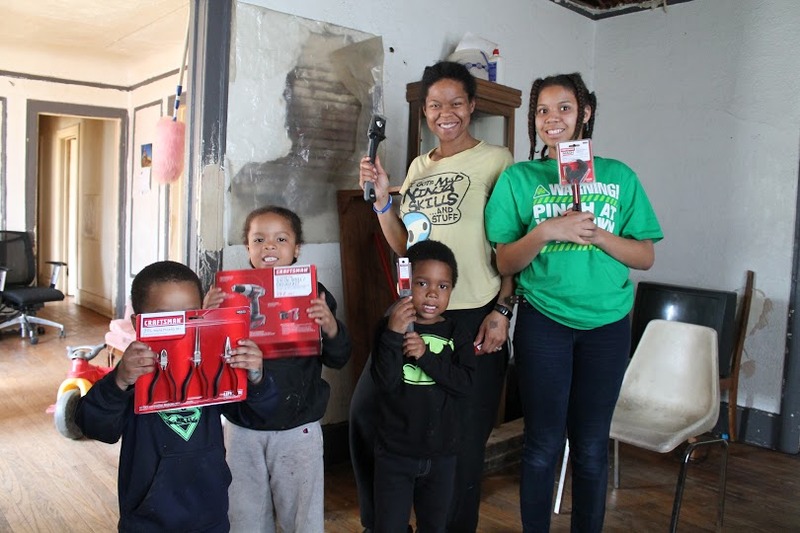 The Craftsman tools and support from Brick + Beam Detroit will help to fix up and maintain their investment. Photo Credit: Emilie Evans. For this project, Brick + Beam partnered with the Tricycle Collective to target families who were recently able to buy their own homes—homes that needed a lot of TLC. The Tricycle Collective works to help people renting from delinquent landlords to buy the properties they are currently inhabiting. There is a huge problem with absent landlords neglecting to pay the necessary taxes and bills, leaving their renters without basic services or security. Cassandra and Alex have three children and live across the street from Alex’s mom. They rented this home for years, and were thrilled to be able to finally buy it and have control over their space. And, of course, the kids love being across the street from grandma. Photo Credit: Emilie Evans. Tiffany, a single mother of four, lives with her children and mother. The house has a leaky roof and needs a lot of work, but they are happy to have their own place, some stability, and numerous resources to help them fix up their home. Photo Credit: Emilie Evans. In addition to helping renters navigate this process, the Tricycle Collective has fundraisers to help raise the actual funds needed to buy the auctioned homes, which often only cost around $500. Yes, a mere $500, combined with free rehab resources like those offered through Brick + Beam, and some elbow grease can end a cycle of instability and potential homelessness for thousands of families and individuals. Inspiring stuff. 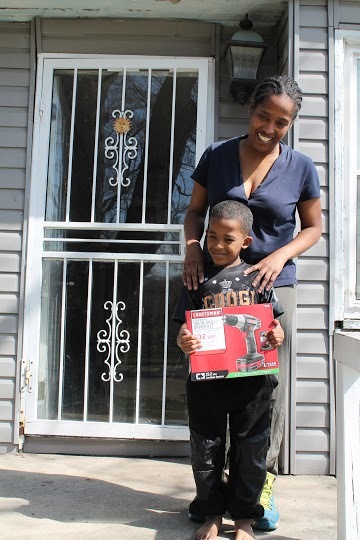 Crystal is a first time homeowner who works for the City of Detroit and has two sons. She was paying rent to a landlord who neglected the property and didn’t pay the taxes. 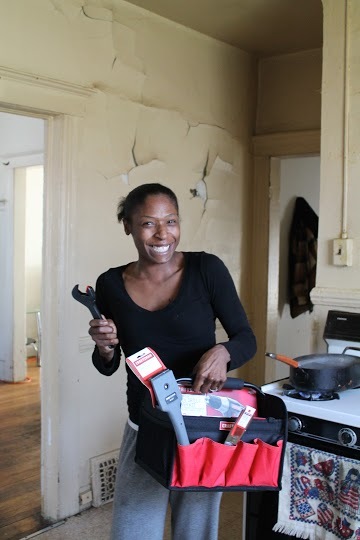 Once her landlord lost the property, Crystal was able to buy her home for just $500 – the cost of a single month’s rent. This has freed up finances and allowed her to take matters into her own hands. Photo by Emilie Evans. To read more about Brick + Beam Detroit’s unique and powerful rehab community, check out the article I wrote about them last month here, and visit their website. For more information about the families impacted by the heroic work of the Tricycle Collective, click here. Brick + Beam Detroit is a collaboration between the Michigan Historic Preservation Network, Detroit Future City, and Preservation Detroit. Victoria Byrd Olivier, and Amy Elliott Bragg, and Emilie Evans are the founders (L-R). Yes, all women, which makes this writer giddy. Buffalo’s University Heights Tool Library: There’s a definite need to buck the overspecialization of trades and to make tools and resources more affordable and accessible to communities with few resources. Detroit’s Americorps Urban Safety Program: Vacant structures need to be secured, lawns need to be mowed, art needs to fill boarded-up windows, and streets need to be cleaned up to make areas safe and to foster optimism in struggling neighborhoods. There may not be money from the city or state, but there are people willing to give their time and energy. South Bend’s Historic Preservation Commission: Having a vintage home and some tools is an incredible opportunity, but most people weren’t born knowing how to rehab a structure and require some know-how. Free or inexpensive hands-on workshops are invaluable and empower individuals and the community as a whole. This month, the TMP has partnered with yet another organization in that region—a group from Detroit—that is creating the bedrock for massive change by fusing many of these strategies. But before you get to hear about the groundbreaking work they’re doing, I thought it might be useful to give a quick and dirty history lesson about what the Rust Belt is exactly, and how these cities—cities with rich histories, ideal geography, and extraordinary infrastructure—experienced such a rapid and devastating decline. So sit back and soak in a little context. The Rust Belt refers to a region of the U.S. formerly known for its industrial jobs, specifically, steel and automobile manufacturing. It also wouldn’t be a stretch to credit this region with having played a crucial role in winning the second World War, with Pittsburgh alone having produced one-fifth of the Allied forces steel from 1940 to 1945. While boundaries vary depending on the source, in general, the belt stretches across parts of Illinois, Indiana, Michigan, Ohio, Pennsylvania, New York, West Virginia and Wisconsin—areas that thrived because of their readily available coal, labor, and inland waterways. This “industrial heartland of America” was booming until the 1970s, when a number of critical things changed. And they pretty much changed all at once. The steel factories that were the bread and butter for a huge percentage of people were shutting down due to a combination of increased automation, the transfer of manufacturing to the West, several devastating free trade agreements, and the general decline of the steel and coal industries. As you’d imagine, this created an industrial and economic free fall that changed the realities of hundreds of thousands of people. Specifically, the U.S. worldwide market share of manufactured steel went from 20 percent in 1970 to 12 percent by 1990, and employment in the industry dropped from 400,000 to 140,000 over the same period. The term “Rust Belt” was coined in the 1980s and became synonymous with economic decline, population loss, and urban decay. Many old homes in Buffalo, NY are vacant and slated for demolition. Fortunately, the city’s Urban Homestead program allows residents to buy these homes for just $1 each, as long as they agree to renovate and occupy them. Programs like these are crucial, but they need additional support from groups who will help homeowners navigate the work. Needless to say, these cities are still struggling. Populations plummeted when many were forced to move elsewhere for work, and those who remain and are doing what they can do deal with the economic realities and vacant property issues. 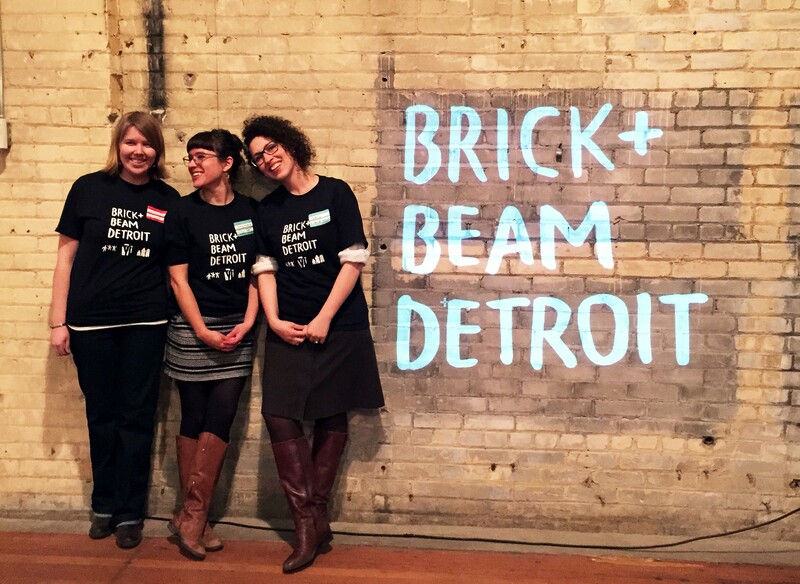 So it’s a darned good thing that so many organizations are stepping up, like Brick + Beam Detroit. As I mentioned earlier, Brick + Beam is taking what many pioneering organizations are doing and going a step further. They’re not only educating residents about rehab directly, they’re thinking bigger and creating an infrastructure for a massive community forum with potentially endless resources available to rehabbers. 24/7. This makes a whole lot of sense because, well, maybe you really want to fix your wood windows before winter but oops(!) you missed the one class a year that is offered. What do you do next? Can you do the work yourself, or is there a reasonably priced contractor out there who will actually do the work well? Also, what in god’s name is a glazier point? They’re making resources (and moral support) free and accessible to all. 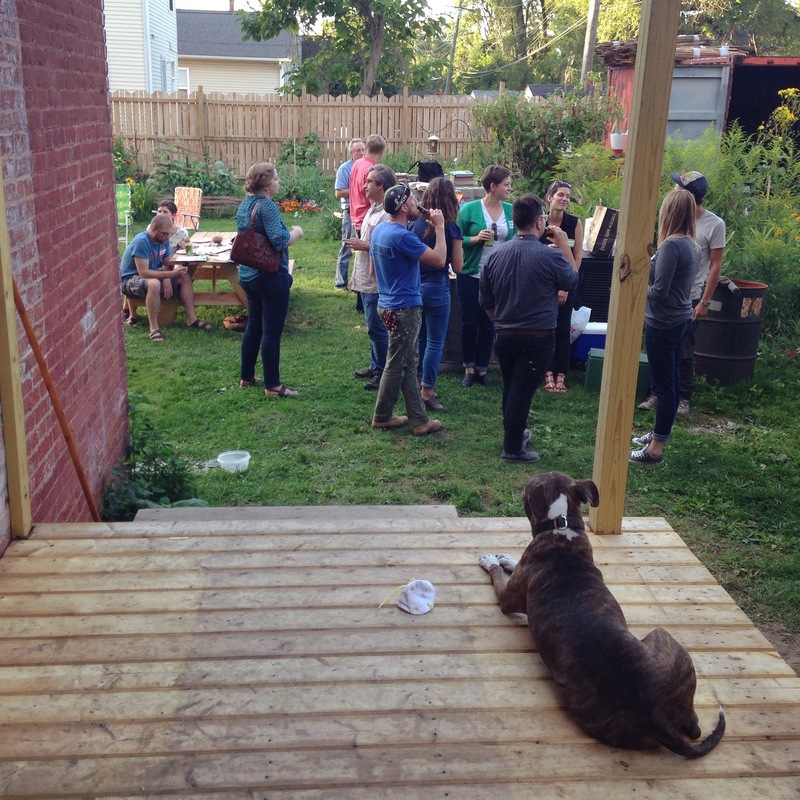 Brick + Beam began by holding monthly (mostly free) events for people wanting to know how to fix up their homes. But these aren’t typical lecture-style meetings. These events include incredibly well attended open mic storytellings (rehab stories! ), panel discussions with local contractors to field their questions, and even a “fixer-upper supper club” that was held at the site of an active rehab project. As a result of these events and partnerships with skilled professionals, a community web is beginning to catalyze and rehabbers are sharing their tips (and, likely, minor catastrophes) with others in the same boat. But beyond these events, they’re also creating a website that will serve as a hub for people interested in property rehab. This will be accessible at all hours as a result, and contain a Q&A forum, a resource library, and a map that shows where the forum members’ properties are located and what they’re working on. These concentrated areas will be “hot spots” that will reveal which neighborhoods are seeing new, concentrated investment–information that can be used in a number of ways. They’re also working on a “Launch Box” that will be stocked with how-to guides, stories, resources, and other goodies for first time homeowners. The “Launch Box” was something that especially made my ears perk up. It seemed a perfect opportunity for a partnership, so TMP partnered with Craftsman this month to give a handful of homeowners some essential tools they’ll need to fix up their “new” vintage homes, as well as a cheat sheet of tool essentials. These kits were hand delivered last week and we can’t wait to hear (and see) the follow-up!